A shooter belonging to the sub-genre of the so-called rail-shooters, in which we play the characters known from various fairy tales and legends. Zombie Panic in Wonderland DX is a conversion of the game from the Nintendo Wii console. Zombie Panic in Wonderland DX is a fun action game in which players have to exterminate legions of zombies. The game allows you to control several different characters (alone or in cooperation with friends) and has a characteristic, manga graphic style. The title is a conversion of a game released in 2010 on Nintendo Wii (it was also released on iOS and Nintendo 3DS). The Japanese company Akaoni Studio is responsible for its development, and Nintendo took the role of the publisher. The action Zombie Panic in Wonderland DX takes place in the titular Wonderland, which has been captured by bizarre, bloodthirsty zombies. The main character is Momotaro - a young man (known from the Japanese fairy tale titled The Peach Boy), who returns to his village years later. He is accompanied by his friends from other fairy tales - Dorothy (The Wonderful Wizard of Oz), Alice (Alice in Wonderland) and Snow White. 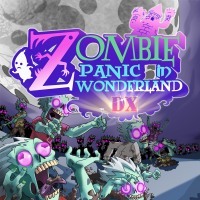 Zombie Panic in Wonderland DX belongs to the so-called rail-shooter genre. The action is observed from third-person perspective (TPP). The game takes place on static levels and focuses on exterminating bloodthirsty undead - we do not walk around the locations, but we can move sideways during combat to avoid objects thrown by enemies. After finishing a sequence, we are moved to the next place and face new enemies. The game offers several different characters, as well as a wide range of weapons to choose from, including machine guns, sword and mini-guns. We recive points by killing enemies and causing destruction - the results achieved by us are recorded on a special board. The game does not offer the ability to save your progress during the mission - every time we die, we are forced to start the level from the beginning. Zombie Panic in Wonderland DX can be played alone or with others. In single player mode, the game offers a campaign, in which travel to the locations known from many popular fairy tales. The cooperation mode allows up to two players to play together (in Arcade mode) - players can choose one of the available characters. Zombie Panic in Wonderland DX has a fairly simple three-dimensional graphic design. The plot is presented through two-dimensional, hand drawn and animated images of the characters. Although the level designs and the effects accompanying the attacks are unlikely to delight anyone, the manga artstyle does look good. A positive impression is also made by the physics system - we have here a partial destruction of both the environment and enemies (e.g. shooting off the limbs). The opponents themselves also look interesting - they are funny and grotesque at the same time.